Welcome to the Tools and Accessories! If you are a new Creative Cutter owner or are just wanting to strengthen your skills with the tools and accessories this is the perfect place to start! Please be patient when opening videos as their loading speed can vary depending on your computer and the size of the video. If you don’t know where to start, we have put our videos in their suggested viewing order so just start at the top and work your way down. Enjoy! Please note that these videos may require you to install Adobe Flash Player and/or Apple Quicktime. You can find Adobe Flash Playerhere. You can download Quicktime from Apple here. The cutting strip is a important part of the Inspirations that needs replaced as it wears out. Learn what the purpose of the cutting strip is and how to recognize when it is time to replace it. This tutorial will teach you how to replace your own cutting strip and what tools you need for the job. Learn how to use this amazing tool so that your machine will draw instead of cut! If you are thinking of purchasing the pen tool or have a pen tool but don’t know how to use it this video is a must see! We will show you how to correctly install a pen in to your pen tool, how to put the pen tool in to your machine to get the proper height, and how to prepare your cutting file for the drawing with the pen tool. You will also learn how to draw on your page and then cut around it. Decorate the walls of your home with Pazzles Wall Vinyl. This video will show you how to set up your Inspiration Studio Software to create and cut your wall vinyl projects. Learn how to prepare the vinyl for application and how to use the Pazzles Wall Vinyl Transfer Tape to apply the vinyl to your walls. Learn how to use a glue pen and the Inspiration Pen Tool to make beautiful embossed designs using embossing powder. This tutorial will show how to move the rollers out of the way while using the glue pen. You will also learn the techniques for drawing the embossing lines and how to apply the embossing powder. The new Pazzles Inspiration Pen Tool will accept pens in a variety of thicknesses from a ball point pen to a Sharpie® marker. Learn how to use the Pazzles Pen Tool for different thicknesses and types of pens. You will also be shown the correct way to install the tool and set the height of the pen. Make your home a work of art! 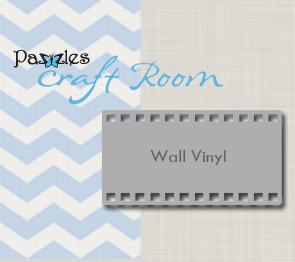 Use Pazzles Wall Vinyl to create beautiful art on your walls, home decor items, and even your scrapbook pages and cards. With Pazzles Wall Vinyl and your Creative Cutter you can make beautiful, personalized designs for your home for just a few dollars! The Pazzles Distressing Tool can create aged, shabby chic, and other distressed looks. Use white core and color core cardstocks and the distressing tool to make fabulous projects. The video will teach you how to use the Inspiration Studio Software to make the most of this amazing tool. You will learn how to fill a shape for a bold distressed look. Another distressing technique will create a delicate look that allows you to even distress words and decorative accents. Create the illusion of zig zag stitching on a card or scrapbook page easily with the Pazzles Pen Tool. In this tutorial you will learn how to set up a project to add zig zag stitching overlapping 2 independent pieces of paper. Learn how to set up the cutting mat with 4 different colors of paper and how to rearrange the pieces to make the patchwork. You should already be familiar with how to use the Pen Tool before watching this video. Did you know that you can create personalized rhinestone design with your Inspiration and the Pazzles Rhinestone Starter Kit? Our kit gives you the same tools the professionals use so you can create rhinestone designs for apparel, accessories, scrapbook pages and more! If you can iron it, you can put rhinestones on it! This step by step tutorial will show you exactly how to use the Rhinestone Starter Kit to start creating your own bling! Learn about the new partnership between Pazzles and Spellbinders. In this video we will show you how to use the new Spellbinders Digital Dies to create endless combinations of beautiful designs. We’ll show you what the file lines look like and how you can use them in conjunction with Spellbinders metal dies. Learn how to add realistic shading and color to your cut paper pieces. In this tutorial you will learn how to use the Pazzles Chalking Tool with chalk, chalk pencils and chalk inks. Learn how to blend the chalk, how to set the chalk so it will not rub off and how to mix chalks to get custom colors. Cut fabric for home décor, craft, appliqué and quilting projects. In this tutorial you will learn the different ways to prepare the fabric for cutting and when to use each one. You will also learn what products to use in the preparation of the fabric to make the cleanest cuts. Finally, learn how to place the prepared fabric on the cutting mat and when to use the Red Fabric mat. Have you ever wished you could create a cake like the professionals do? Now you can get beautiful results right at home using your Pazzles Inspiration with the new Pazzles Pastry tool and Pastry Starter Kit. Enjoy the freedom of being able to create any design and use any font and then cut your design in edible materials such as frosting sheets, fondant, gum paste, cookie dough, modeling chocolate and more. With the Pazzles Pastry tool and Wilton Sugar Sheets you can make beautiful custom cakes in no time. This video will show you how to turn a plain frosted cake from the bakery into a work of art. The Piercing Tool will add pierced accents to your cards, scrapbook pages and other crafting projects. Learn how to determine what pressure to use and how far apart to space the pierced holes. You will also learn how to prepare the piercing mat and maintain it for longevity. Use the Pazzles Iron On Transfer material to create clothing, linens, décor items and giftables with your Pazzles Electronic Cutter. Part 1 will show you how to cut and iron on basic one color projects from the Smooth Iron On material. Learn what you need to create iron on projects, how to set up the software, and how best to iron your design down. With the Pazzles Electronic cutting systems and Pazzles Iron On Transfer material you can create beautiful clothing and gift projects. Part 2 will show you how to create 2 color projects from the Smooth and Flock Iron On materials. Explore fun and exciting ways to create designer clothing and gifts with Pazzles Iron On Transfer material and your Pazzles electronic cutter. Part 3 shows you how to create and cut multi-color projects using the Glitter Iron On material. Learn how to use vinyl to create décor items and gifts for any occasion. If you think you could only cut paper it is time to consider the possibilities of vinyl! In this video you will learn how to set up your project for cutting. We will also show you how to use the weeding function to help you remove your cut project from the vinyl backing. Finally, we will show you how to apply the vinyl to your project using transfer tape and how to get a smooth application. Pazzles Window Cling kit helps you make fun window decorations for any celebration or holiday. In this video you will learn how to use markers to add shading and details to your designs. Learn which pens will work to color the cling and what tools you will need to apply and blend the colors. Make your own custom rubber stamps with the Pazzles Rubber Stamp kit. Learn how to decide on an image for a stamp and how to create the cutting file. The video will also show you how to make the stamp from start to finish and what supplies you will need. The Embossing Tool will add a new dimension to your Pazzles Inspiration Cutter. In this video you will learn how to use your Embossing Tool on Vellum, Cardstock and Foiling Metal. We will also show you how proper care of your embossing mat is important and will add to its longevity. Also learn how to choose the proper pressure for embossing on different materials and what constitutes a good embossing design. Using the engraving tool you can create beautifully engraved designs on all different kinds of mediums. The engraving tool has a diamond tip and will etch designs on metal, acrylic, glass, and wood and more for a lasting personal touch. In this tutorial we will show you some ideas on how you can use the engraving tool on several different mediums. You will also learn how to set up your design to engrave and learn how different settings can create different looks. You will also learn how to correctly position items on the engraving mat so that your design is engraved exactly where you want it to. Chalk can break into pieces making it hard to manage. This video will show you how to fix your broken chalk and make it one piece again. You can make beautiful etched glass projects using etching cream and stencils created on your Pazzles Inspiration. Cut etching stencils and masks from Pazzles Vinyl, transfer to a glass suface and coat with the cream. This tutorial will show you step by step how to etch on flat and curved glass objects to make elegant etched designs. With Pazzles Stencil Plastic you can create custom stencils for any project. In this lesson you will learn what cutting files work best for stencils. You will also learn how to cut the plastic and how to prepare it for stenciling. Learn how to engrave on a non-metal material: sequins! Sequins come in many different sizes and colors and can add a fun accent to your project. They are lightweight and inexpensive so why not give them a try? This lesson will show you how to set up for engraving on sequins and includes the entire project cutting file for the Happy Day sunflower card. You can create rhinestone fonts using any font on your computer. Journaling fonts will give you a single row of rhinestones, while regular fonts will give you two rows of rhinestones that outline your letters. But did you know that you can create single row rhinestone fonts using any font with just one extra step?